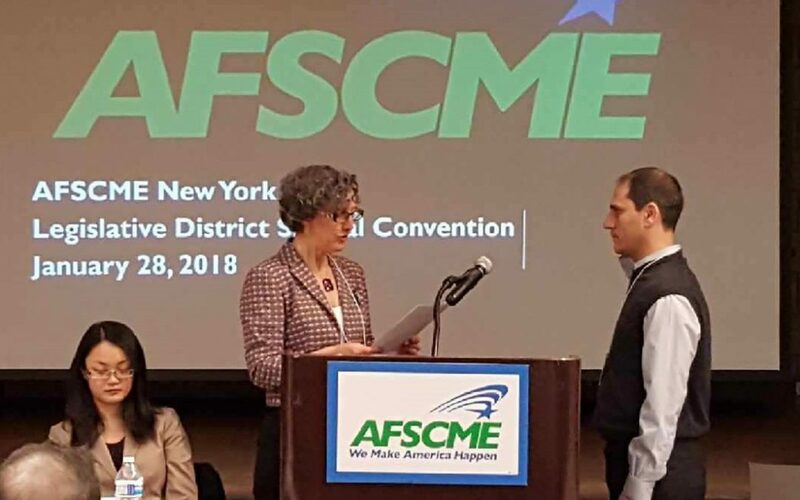 New York – January 28, 2018 – Council 66 scored a stunning upset when it unexpectedly won a seat on the Executive Board of AFSCME International at a convention held in New York City. Council 66 President Dan DiClemente was elected International Vice President (IVP) with 16,504 votes to 13,036 votes for his opponent. Upstate delegates from Council 66, Council 82 (New York State Law Enforcement Officers Union) and Council 35 (City of Buffalo) joined with many downstate members of District Council 1707 to elect someone to serve as International Vice President who will be a voice for workers across the State. “The International Vice Presidents are there to represent AFSCME workers and affiliates. They serve a critical role as the voice of the rank-and-file membership on the national union’s Executive Board,” said Barbara Zarpentine, Recording Secretary for Council 66. AFSCME has thirty-two International Vice Presidents that speak on behalf of all 1.3 million AFSCME members throughout the country. Each IVP represents thousands of workers in their region and is responsible for serving the interests of the Councils that elect them. “This marks the first time in decades that the regional seat has been held by an AFSCME member outside New York City. Council 66 is achieving the impossible,” said newly-elected International Vice President DiClemente. DiClemente will complete the unexpired term of Victoria Mitchell, who stepped down from her position as AFSCME International Vice President in 2017. His first term in office will end in the summer of 2020, when AFSCME holds its regularly scheduled convention.